The turning colors of the leaves always signal the beginning of the fall, apple picking season, pumpkin patches, and even more exciting in Jersey City—Oktoberfest! Zeppelin Hall, an authentic European style biergarten in downtown Jersey City, has been celebrating the German holiday since mid-September and dedicating each weekend to a different German city. I visited popular beer hall this past weekend, when they were celebrating the city of Dresden. Finding an empty space at their tables inside proved to be impossible (surprising, considering the size of the rooms! ), as it was packed with families, a few birthday parties, and a ton of Yankee fans watching the post-season game on their big screen TVs. Instead, we headed to the outdoor garden to enjoy the late afternoon sun at their large communal picnic tables. On the way, we stopped at the bar and ordered up two large steins of beer: a Purple Haze for me and a Spaten Oktoberfest for the boyfriend, $12 each. Purple Haze, a lighter beer with a hint of raspberry, was crisp and refreshing paired against the bolder, lager style beer of the Oktoberfest. As the sun set and the temperature dropped pretty quickly, we headed back inside to find a seat and decide on some food. The menu is loaded with Bavarian specialties including currywurst, chicken and pork schnitzel, cheese spaetzel, sauerbraten, and potato pancakes, along with classic bar menu staples like jalapeño poppers, burgers, and chicken wings. 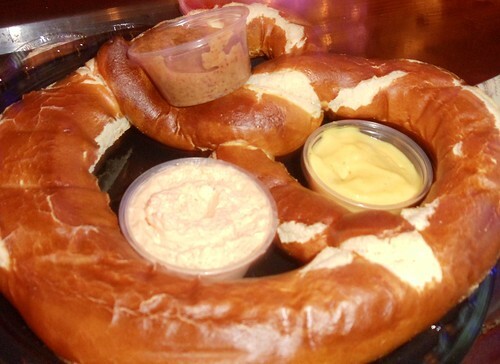 Since we had visited the beer garden before, it didn’t take us long to decide on the sausage sampler platter and a giant pretzel to munch on. The sausage platter came stacked high with fresh and crispy French fries, soft rye bread, sauerkraut, and your choice of three sausages: Bratwurst, Kielbasa, Andouille, Chicken Bratwurst, Cheese Bratwurst. We knew from experience that the cheese bratwurst was our favorite, which we ordered along with the kielbasa and Andouille. While they were both terrific, the cheesy bratwurst still came out the winner. It has all the robust flavors of a traditional bratwurst, with just a hint of cheese that slightly oozes as you cut into it. Their giant pretzels, imported straight from Munich, are truly giant in size and come with a trio of dipping sauces: honey (with a slight apple kick to it), Bavarian mustard (tangy and sweet, similar to honey mustard), and obasta cheese dip (thick, almost cream cheese texture but very flavorful). 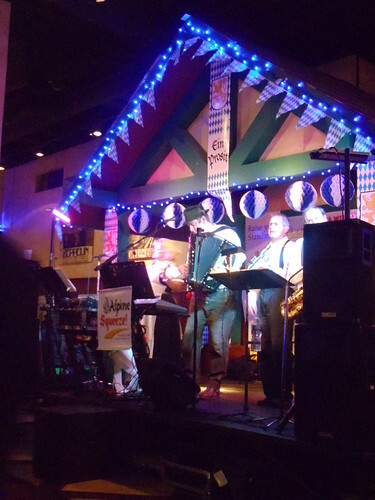 It wouldn’t be Oktoberfest without some German music, and a live band called Alpine Squeeze went on at 8pm, delivering German tunes, traditional drinking chants (Eins, zwei, drei, g’suffa! ), and even a little Sound of Music thrown in for good measure. Last weekend marked the end of Oktoberfest at the beer hall, with a celebration dedicated to the German city of Cologne, with Hacker Pshorr beer on tap, goulash over spaetzle, a live band (Ja Ja Jas), and a dance ensemble from Germany. Luckily, Zeppelin Hall serves up their German cuisine year round, 365 days a year, and offers ample free parking, wi-fi access, and enough beers on tap to impress even the most experienced counessieur—144 to be exact. Take your pick with a pint glass ($6), an ambitious liter ($12), or a flight with four different 5 oz. samplings. If you missed Oktoberfest this season, be sure to check out their Thursday networking nights and happy hour and NFL Sunday and Monday Night Football on their big screen and projection TVs. They’re also playing host to a two-day Halloween Party on Friday, October 29 and Saturday, October 30. For more info, check out their official website below.